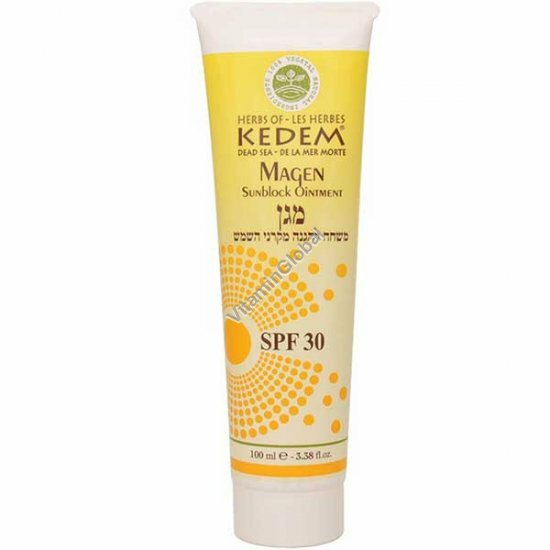 The Sunblock Ointment contains plant extracts and the Dead Sea minerals which effectively protect your skin from sun rays and give the skin softness and youth. Ingredients: Shea butter, zinc oxide, sunflower seed oil, canola oil, avocado oil, palm oil, coconut oil, jojoba oil, beeswax, castor oil, cocoa seed butter, calendula extract , lavender extract *, everlasting extract *, chamomile flower extract. *From organic farming in the Judean desert region. Usage: Apply generously and evenly before sun exposure. Reapply after swimming or sweating, immediately after towel drying and at least every 2 hours.